The last home game of Parkside Middle School’s varsity boys basketball season was a dream come true for 14-year-old Kavon Davis Wednesday evening. Coach Joe Burgess surprised Kavon not only with a uniform but also with news that he’d be starting. “We're going to get that rock to you, and you're going to let it fly and you’re going to make some shots and you're going to play some defense,” Burgess told him. 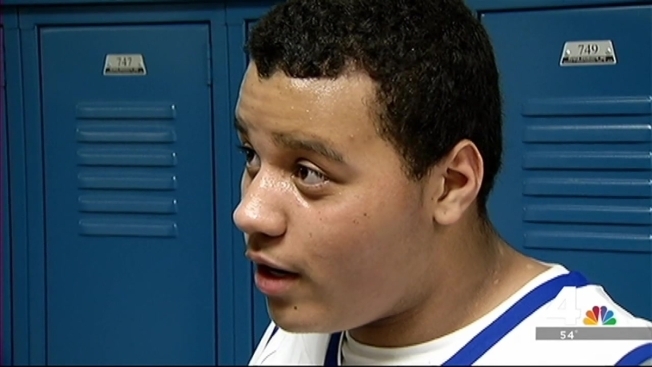 Kavon, an eighth-grader with special needs at the Manassas, Virginia, school, tried out for the team before the season. He didn't make the squad but he did make a great impression, earning a spot as team manager. And Kavon Davis, No. 44, contributed from the start, scoring on the first shot of the game. “It doesn’t get any better than that,” Coach Burgess said.